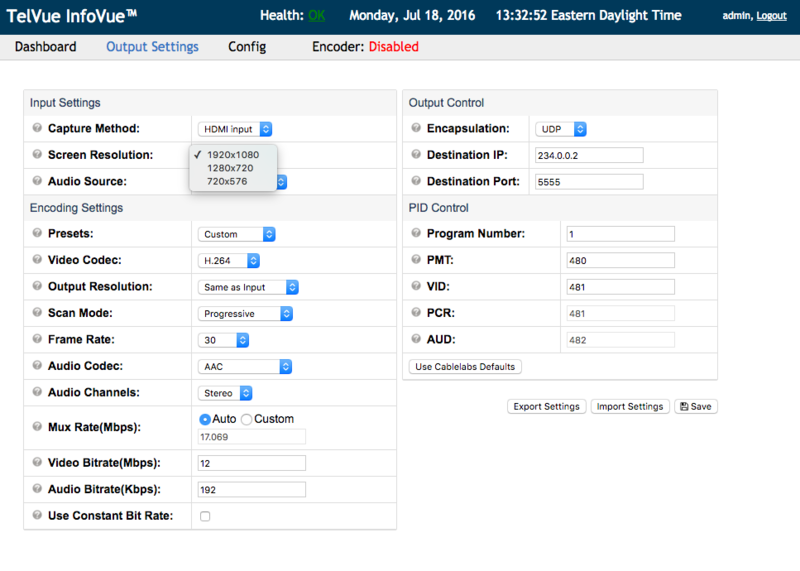 The InfoVue Pro Configuration User Interface is used to initially set up the IP output encoder settings, and manage networking configuration. To log into it, point a web browser at the IP address you have assigned to the unit, and use the username and password admin/admin. 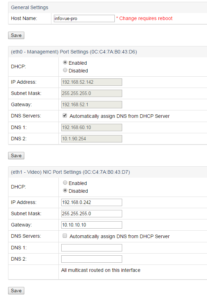 After the initial setup, you shouldn’t need to modify these settings unless your broadcast setup changes. For instructions on how to set up your InfoVue Pro unit and log in to the configuration UI, please refer to the InfoVue Quick Start Guide. 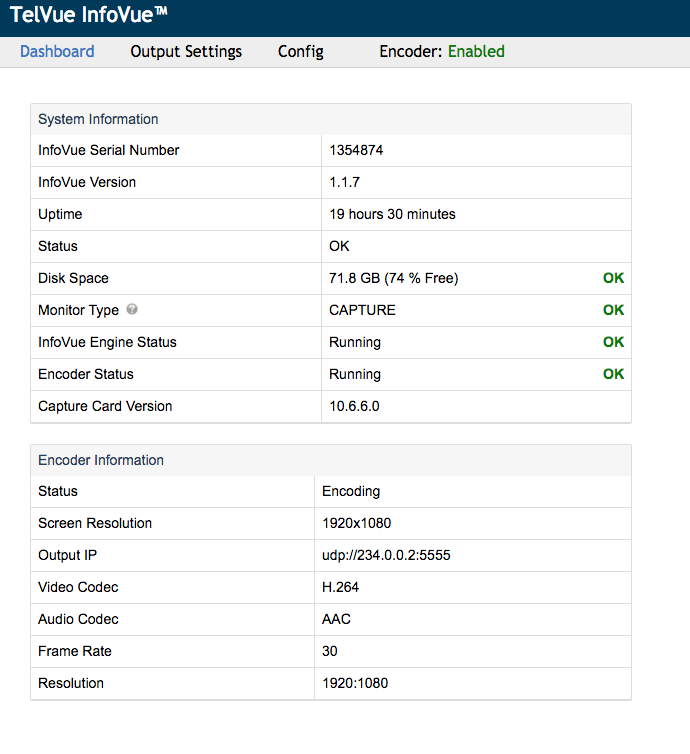 Log in, and you will see your system information at a glance including – when enabled – the encoder. This will show you at a glance whether the InfoVue Pro is working properly, and if not, give you the information to troubleshoot. In order to change the output settings, the encoder must be disabled. The InfoVue Pro comes with preset settings which are recommended for most users. Presets: Offers 4 presets. Sets recommended values for H.264 and MPEG-2 for both High Definition(HD) and Standard Definition(SD). Choose “Custom” to set your own. Screen Resolution: Screen Resolution is the resolution on the InfoVue Player. Three input resolutions to the encoder are supported. For 16:9 HD, it is recommended to use 1600×900 or 1280×720. For SD output formats please use 720×576. Audio Source: Audio Source selects between using the native audio from the InfoVue signage player, or using a specified external audio stream such as an Internet radio stream, or USB audio dongle. Output Resolution: The resolution of the encoded output stream. Scan Mode: The scan mode of the output stream. 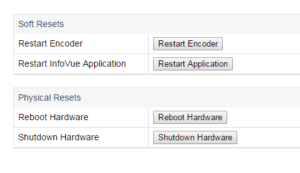 Different options are available based on which video codec is selected. Either mode can use Progressive scan mode. H.264 can also use Macroblock-adaptive frame-field (MBAFF), and MPEG-2 can use interlaced Top Frame First (TFF) or Bottom Frame First (BFF). Frame Rate: Sets the output frame rate for the encoder. Audio Codec: Audio Codec sets what encoding to use on the outgoing audio stream: MPEG-1 Layer 2 or AAC. Audio Channels: Audio Channels allows you to pick between mono and stereo audio output. Mux Rate(Mbps): Sets the Multiplex (MUX) rate for the outgoing stream. This is how much data is stuffed into each outgoing packet. In standard applications this should be higher than the sum of the audio and video bit rates. “Auto” setting is recommended. Video Bitrate(Mbps): The Video bit rate correlates to the video quality of the outgoing stream. A higher bit rate means higher quality, but also takes up greater bandwidth. Audio Bitrate(Kbps): The audio bit rate correlates with the audio quality of the outgoing stream. Use Constant Bit Rate: Checking this box causes the encoder to attempt to keep the bit rate constant, decreasing quality when the input stream gets complex, and increasing it when it is simpler. InfoVue gets close to Constant Bit Rate, but may not fully achieve it with all settings. Encapsulation: The encapsulation protocol used to transmit the outgoing stream. “CableLabs Defaults” is recommended for all but the more advanced users. The encoder is responsible for producing the IP output stream. Restarting the encoder will re-initialize the IP stream. Restarting the InfoVue Application will restart the graphics engine.